A report by the Federation of Small Businesses suggests Brexit could lead to new opportunities for UK exporters. A lot has been said and done since the UK voted to leave the EU in June’s referendum this year, but the business world is now beginning to acclimatise to the possible realities of a post-Brexit world. The outlook could be a good one for UK SME exporters looking for new opportunities for growth due to the declining strength of the pound, less EU regulation, and a new era of UK trade giving potential in which UK exporting will hopefully take centre stage. In a new report, the FSB points out that is a great opportunity for SME exporters to make a greater contribution to the UK economy with the need to close the trade deficit now greater than ever. There will of course be challenges for UK businesses. Europe will continue to be a key market for most UK exporters and the terms on which the UK will be able to sell into Europe will be redefined over the coming years. But there is hope of a favourable deal with the trade bloc and there is certainly a political will for new more beneficial trade deals with emerging markets around the world to create new opportunities for UK business. 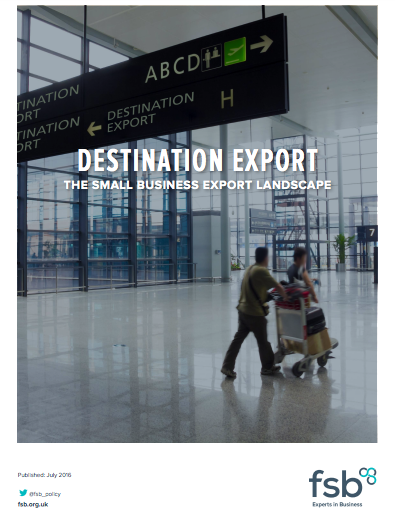 The report was released over the summer and Open to Export, in conjunction with our founding partners the FSB, will endeavour to share further information, guides and reports for the UK’s SME exporters as the post-Brexit landscape continues to take shape.